I honestly can’t remember the last time I baked, let a alone baked a cake. But since it’s the holidays, I decided to try baking an American recipe (since most of my dessert recipes are Russian/Ukrainian). 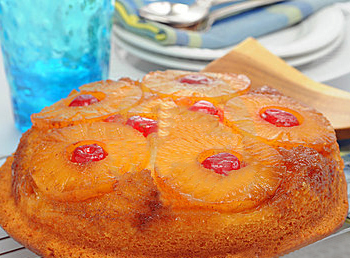 I think I’ve only had the pineapple upside down cake once or twice in my life, so the thought of baking one myself made me nervous. But, I did it, and it turned out so good. A hint of coconut makes all the difference. And by the way, there is no butter in the cake batter. I do have to say that I NEVER use canned products and having to use canned pineapple (from Whole Foods) made it scary for me. However, once a year I’ll give myself a free pass to indulge in “guilty foods”. Anyway, hope you enjoy the recipe. I definitely see the cake batter being used with other fruit, like apples, pears, or peaches. I might try to make an apple upside down cake sometime next year. For the pineapple: In a 10-inch cast-iron skillet (or a 10-inch non-stick skillet) over medium heat, melt the butter and add the brown sugar. Cook, stirring constantly, until the sugar melts, about 2 minutes. Remove from the heat and arrange the pineapple slices in the skillet. Fill in the spaces with the crushed pineapple. Set aside. Note: when you first put in the pineapple slices in the skillet they will sizzle because of the hot butter/sugar mixture, be careful not to burn yourself. For the cake: In a bowl, whisk together the flour and baking powder. In another bowl, combine the milk, vanilla extract and 1/4 cup of the reserved pineapple juice. In a large bowl, with a hand mixer, combine the granulated sugar and coconut oil on medium speed until thick and creamy, about 3 minutes. Beat in the egg. Add half of the flour mixture and mix on low until just combined. Add the milk mixture and stir until just combined. Add the rest of the flour and mix until combined, about 1 minute. Pour the batter over the pineapple slices in the skillet and spread evenly. Bake until the top is golden brown and a toothpick comes out clean when inserted, 25 to 35 minutes, checking after 20 minutes to make sure the top isn’t getting too brown. If it is, cover loosely with aluminum foil. Let cool for 15 minutes. Invert the cake onto a large platter. Serve warm with a side of vanilla ice cream if you prefer.